Stony Plain MLA Erin Babcock, speaking on local economic issues such as the Growth & Diversification Act, Coal Fire Shutdowns and the resulting effects on the local economy, as well as an immediate need for the Highway 60 Rail Overpass Project to be placed on the Alberta Government Funded List. Alberta Finance Minister Joe CeCi, addressing the new Alberta Budget. Both emcees, Jo-Anne Willis – ABA Director and Natalie Birnie – ABA Executive Director, helped to very creatively and convincingly remind Minister Ceci about making funding of the Highway 60 Rail Overpass Project an absolute TOP PRIORITY for the region. 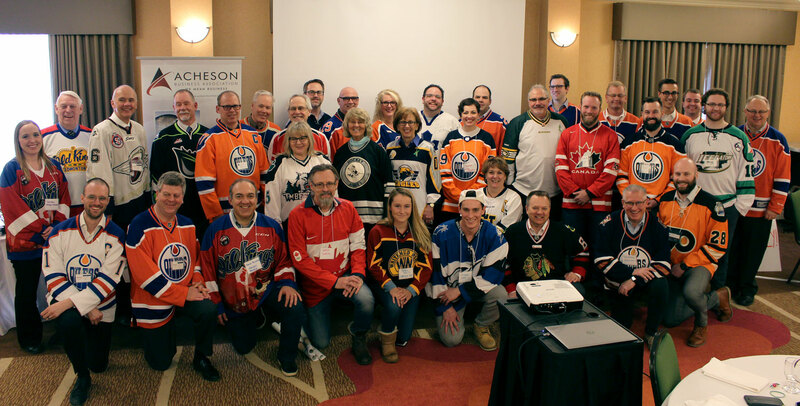 Luncheon attendees were asked to wear Hockey jerseys to honour the loss resulting from the Humboldt Broncos Hockey Team Bus Tragedy. Four members from the Spruce Grove Saints Hockey Team attended as guests of the ABA. A moment of silence was held, recognizing their collective bereavement. The ABA has determined that a $1,000 donation will be made to the Alberta STARS Air Ambulance Service, in honour of the Humboldt Broncos. There were four of us in attendance from TRINUS: Dave White, Kevin White, Jon Harmon, and Chris Penn. Copies of the new 2018/19 Acheson Business Directory were distributed to all attendees and the new online version has been made live, which you can view here. The next ABA event is the much anticipated annual Golf Tournament happening on Friday, June 22. Enjoy a day of networking and Texas Scramble Golf, followed by a delicious steak BBQ, also featuring competition prizes. Relax, enjoy the outdoors, and network with colleagues from area businesses. Online registration is now open. Click here to secure your spot.